New for 2010, the ProForm 1050T treadmill is a mid-range model that offers a nice entertainment package, and all the standard features – big motor, advanced cushioning, selection of workouts, and folding design – you’ve been wanting. The ProForm 1050T treadmill comes with a backlit LCD displaying a RaceTrack oval graphic to track progress, and readouts show time, speed, distance, calories burned, and more. The console features quick controls – one button to select speed and incline manually, or select one of 20 workouts and the treadmill automatically adjusts the speed/incline for you. The 1050T also is compatible with the iFit® Workout Card system. * iFit cards ($20 each) are sold separately. UPDATE: The ProForm 1050T is no longer available. To find a comparable treadmill check out the new full lineup from ProForm on the company site to see which model appeals to you. As one of the top models in ProForm’s Tech Series, the ProForm 1050T treadmill comes equipped with the impressive ProTech™ Adjustable Cushioning system, which can reduce impact on the joints up to 33% compared to road running. This increases your ability to workout longer and harder for faster results. The ProForm 1050T is powered by a quiet 3.0 continuous horsepower motor, and features a large 20 x 60 belt, 12% incline, and a 325-lb user capacity. Along with 20 pre-programmed workouts, it has an entertainment system on the console that consists of an iPod® or MP3 plug-in port and two 2" speakers. 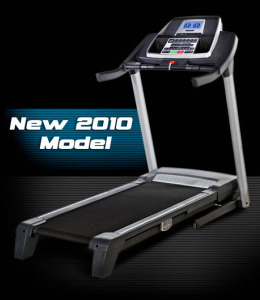 This is a new model for 2010 so you won’t find many treadmill reviews from customers and equipment pros on the ProForm 1050T. 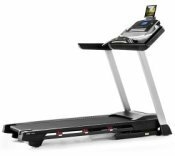 With an MSRP of $1,599, the 1050T is very middle of the pack and does not measure up to the top treadmills in this price range. The good news is, we have seen the ProForm 1050T offered in weekly online sales for $799 to $899, and that includes free shipping (a $150 value). When that steep MSRP drops that low, then this model is an excellent deal. You won’t find many machines at $900 or less with a 3.0 CHP motor, adjustable cushioning, a commercial size running deck, and all the rest of the features. If you can find the ProForm 1050T treadmill on sale at that price with free shipping, you can opt for a one-year Extended Service Plan ($79) to help pad the otherwise weak warranty on parts and labor.